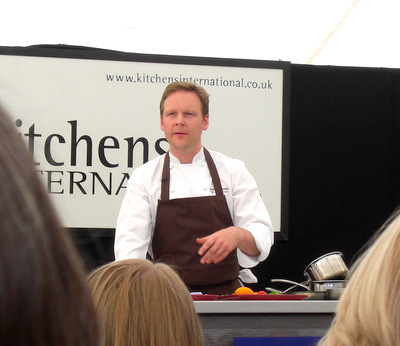 What would you say are the perfect elements of a good cookery demonstration? and of course most importantly, cooks delicious food. Geoffrey cooked a wonderful dish of halibut and heritage tomatoes in tomato essence. I was lucky enough to try a little at the end: intense, tomato-y heavenly goodness. Those of you who have the Foodies at the Festival Brochure will have the full recipe but I thought I’d share the tomato essence with you here using the notes we took as he cooked as they are a little different to the printed version. It’s really important to find ripe tomatoes – J M Craig at the Edinburgh Farmers’ market sell ones for soup which are ideal. Add some of their Claree variety cherry toms, and the mixture will be perfect! Make the essence at least a day before you need to use it. 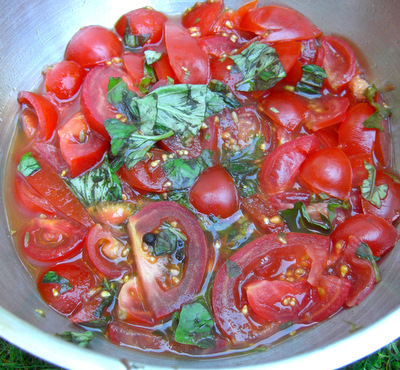 Chop up the tomatoes, place in a metal bowl with the remaining ingredients. Stir well then crush slightly with a potato masher. Cover tightly with cling film and leave in a warm place. Geoffrey explained that he puts the bowl above his cooker which warms the mixture. We tried the airing cupboard, then the greenhouse as the sun was shining. Leave for about 8 hours. Place a sieve over a bowl. Now either line with a tea towel, or put a jelly bag into the bowl. Put the tomato mixture into the sieve or the bag if you are using it. Using a plate or other suitable item, place a weight on top of the tomato mixture and leave to press overnight. 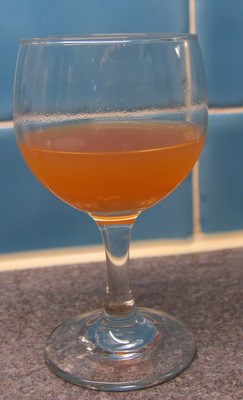 Transfer the juices into a clean container and set aside until needed. To use gently reheat. The essence was served in a soup bowl with slices of heritage tomatoes, olives and torn coriander and basil with lightly cooked halibut. He told the story of where he was when he heard about his Michelin star – in Our Dynamic Earth eating a cheese and tomato sandwich. Somehow that anecdote summed up the man.